Celebrated in one way or another all over the planet, Valentine's Day is all about romance, even if the day's derivation has a grim touch of martyrdom about it. So how did we get from martyrdoms to the modern traditions of romance and love? Numerous early Christian martyrs were named Valentine, including Saint Valentine of Rome whose first romantic inklings come from a 3rd-century written account of his imprisonment for performing forbidden weddings for soldiers. The Roman Emperor Claudius II forbade them to marry, believing that married men did not make for good soldiers. It wasn't until the 18th-century in England that Valentine's Day became an occasion for lovers to express their affection for each other with flowers, sweets and greeting cards. Clearly, not much has changed in a few hundred years. As for trying to stop marriages in Italy, Emperor Claudius II must have had rocks in his head. After all, is there a more romantic place on the planet? We asked ATAS-accredited travel experts for their thoughts. "Paris is the living city of love, the language is beautiful, the food is divine, and walking beside the Seine on a warm Summer's evening is just about the most romantic travel experience I can imagine." But romance isn't the exclusive territory of Paris. Debbie's tip for ramping up the romance wherever you are, is to arrange a couple's massage followed by a private dinner for two under the stars—weather-permitting, of course. "That works just about anywhere", quips Debbie. For Carissa Johnson, Manager of ATAS-accredited Shire Travel, the romantic pull of the Indian Ocean is irresistible. "The Maldives offer the ultimate beach settings with white, powdery sand, turquoise water and friendly, local service", says Carissa. Like Debbie, she also suggests that experiences can heighten the romance. "Splurge on once-in-a-lifetime activities such as snorkelling with Manta Rays, diving with Whale sharks or underwater dining. Sunset drinks and a private destination dinner are the perfect romantic ending to the day. And if you're travelling as a family, pre-book a babysitter to give the grown-ups much needed reconnection time without distraction", suggests Carissa insightfully. With so many gorgeous resorts in the Maldives, Carissa recommends working with the right travel agent to find the perfect resort for you. "It's surprisingly easy to get it wrong if you don't know the destination. And beyond that, your ATAS accredited travel agent will have access to exclusive specials and perks like, for example, a complimentary romantic welcome gift in your room on arrival", says Carissa. Along with Paris and The Maldives, Karen Knight, Manager at The Cruise & Travel Authority, finds French Polynesia particularly romantic. "Tahiti is a beguiling mix of French influence, breath-taking beaches and lagoons, over-water bungalows, French-Pacific dining, hibiscus and frangipani flowers, and sunsets to die for", says Karen. Karen understands the importance of making time for romance, regardless if your location. "Sometimes less really is more. I always recommend not booking too rushed an itinerary so you can spend quality time together. Having said that, you really should book your essentials—like private transfers and any special romantic touches—before you travel so you don’t waste precious holiday time organising these things on the run. Your ATAS accredited travel agent can sort all of this out for you in a snap", adds Karen. We also asked Karen if she thought any mode of travel was particularly romantic. "A number of airlines have some astonishing premium cabins and classes now, but cruising is definitely where the romance is. Many newer boutique ships offer a much more intimate style of cruising than the larger ships that carry thousands of passengers. "As travel agents, we have great relationships with cruise lines, and can arrange special touches such as romantic dinners in the specialty restaurants, or a bottle of bubbly with chocolate dipped strawberries in your cabin on arrival. We really can take the romance up a notch or two", says Karen. Wendy Macfarlane, travel advisor at Travel Associates Erina, can't go past Santorini, Greece, as the world's most romantic spot. "I had my honeymoon there, and the scenery and Mediterranean ocean breezes are still etched in my mind! Santorini is stunningly beautiful in many ways, and has the most gorgeous sunsets and views anywhere", says Wendy. Having travelled to more than 25 countries, Bondi Beach based Jacqui Cameron from ATAS accredited Travel Counsellors agrees with her. "Santorini sunsets over the brilliant blue Aegean Sea are complete show-stoppers", says Jacqui. The perfect recipe for maximising holiday romance? "Put your devices down, enjoy cocktails, let sunsets wash over you, and head out for nice dinners", advises Jacqui. As for romantic modes of transport, Jacqui is fairly agnostic. "To be honest, I think travel by any means of transport is romantic. Especially if you are with the right person", she says. Your ATAS travel agent can help ensure you are set prior to heading off on your romantic getaway but here are a few travel warnings and useful tips to keep in mind. 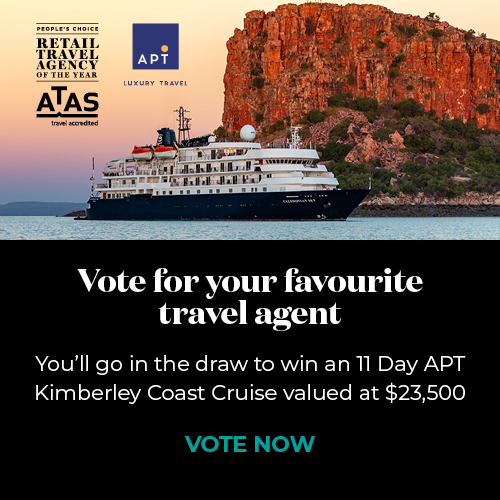 ATAS travel agents recommend that Australia passport holders register for travel alerts before they travel.